In an area of Canada as large as the Yukon Territory, you would think that the distance between towns would be vast. 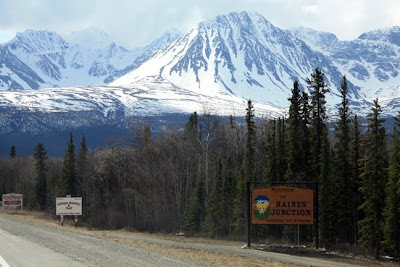 In many cases it is, but there is a whole lot of beautiful country that separates nearby day drives to Skagway, Alaska and on this particular day, Haines Junction. 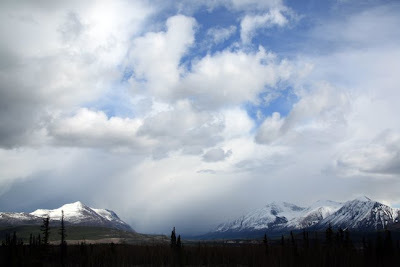 My friend Allison and I headed out on a drive to hike and explore Haines Junction during February and March of this year while I was housesitting for my friend Ian. It was a perfect distance...2 hours to reach Haines Junction, another couple of hours to hike and then the drive back. 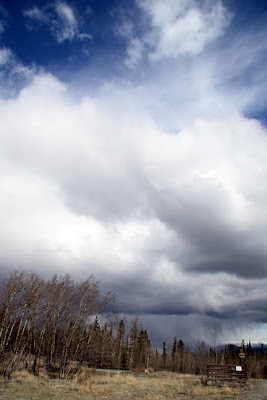 Most of my days during the month I was in Whitehorse were spent working on new paintings brought with me from Ontario. Thus this excursion further afield held great appeal. I had heard great things about this drive, and I was NOT disappointed. 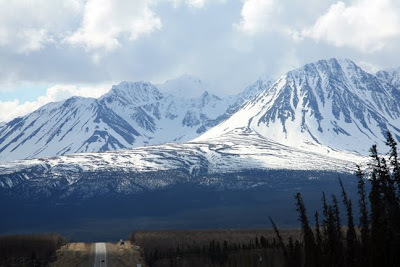 In fact, that drive from Whitehorse to Haines Jct rivals any I have ever driven...we stopped to take a lot of photos as we made our way north and west. 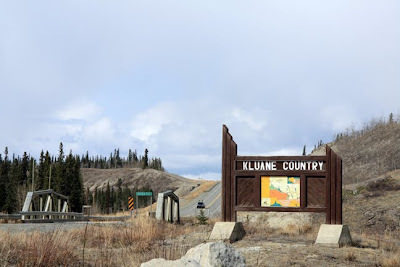 Haines Junction is a perfect jumping-off point to explore the gorgeous Kluane National Park. 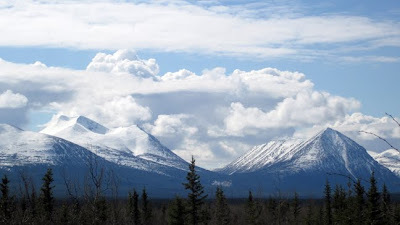 Last summer I went hiking and camping in Wrangell St. Elias National Park in Alaska. You can read about that adventure here! 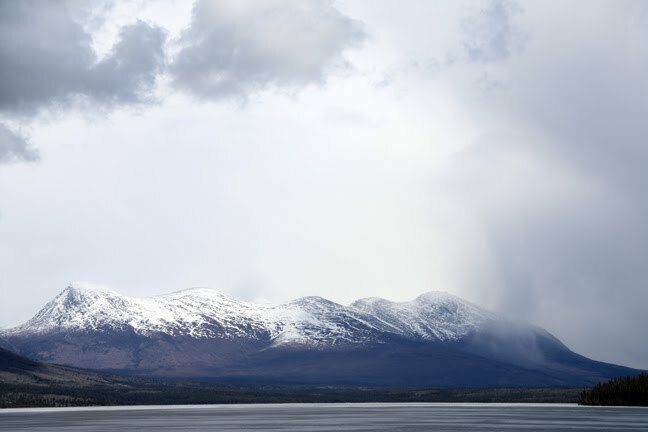 These two parks are joined together and encompass some of the most beautiful landscapes I have ever seen. 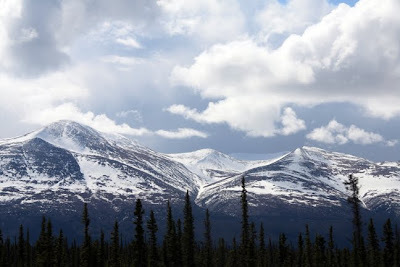 The mountains continued to rise out ahead of us as we drove along. We drove through the Ibex Valley en route to Haines Jct. A week later I would be hiking through the Ibex Valley on a 27km trek that I will never forget. Look for that post in the next two weeks! The weather was typically quite changeable. The big skies of the North enable you to see shifting weather at great distances. The air is very dry in The Yukon. I couldn't believe how arid it was. One's skin becomes dry, the air is thin, and this is in the spring and summer. Ian informs me that this dry climate is even more pronounced in the winter. Tempestuous clouds and far off rain seen on the horizon.. There were very few people on the highway...in fact, not many people period! The highway is so quiet that you look every time a car goes by if you are stopped by the road taking photos...It was the antithesis of Toronto, a far cry from the typical traffic found in Burlington too. 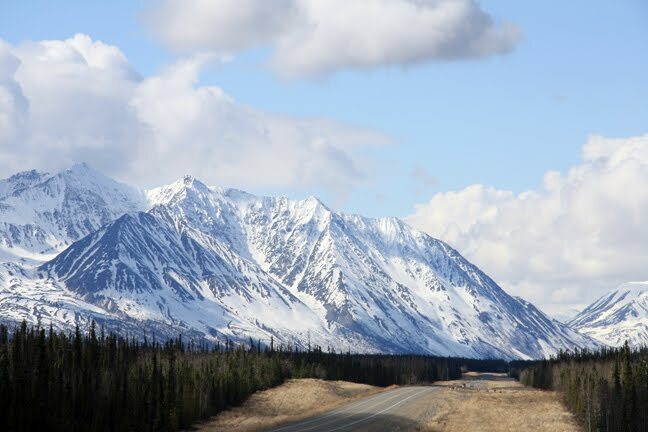 The lack of congestion brought as much peace of mind as the mountains and clean air. Looking out over miles and miles of pristine forest, across untrodden slopes of snowy peaks, is catalyst for calm and inward reflection. The view across the lake by the campground. Sheets of rain can be seen on the right. As we neared Haines Junction I continued to be awestruck by such great swaths of beauty. 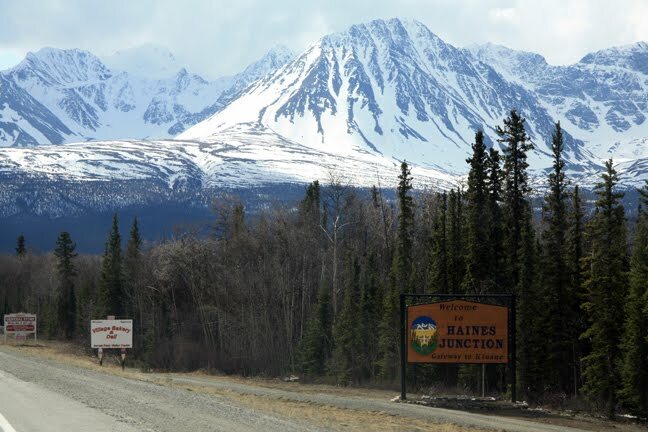 Haines Junction itself only has a few hundred people. It is very small but has a great sense of community. We stopped in at a local bakery/café after paying a visit to the Visitor Centre for some information. We were warned about bears in the area. Fortunately I had borrowed some bear spray from Ian's brother and I had it in my side pocket to retrieve it quickly should I need it. Fortunately I didn't! We opted to hike along the Dezadeash River. 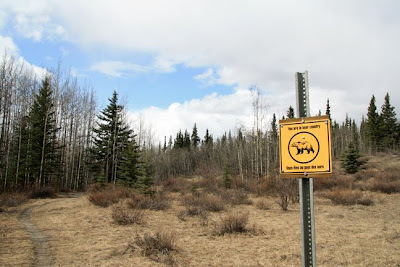 It is an interpretive trail that is 6 kms long but we didn't read the signs, we just enjoyed the hike and surroundings. Allison was a bit on edge with the knowledge that bears were in the area but we continued on. 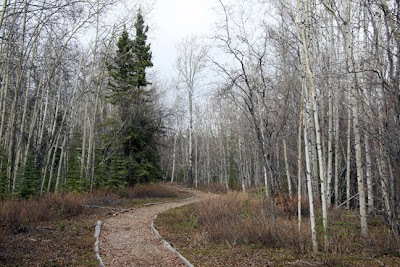 The trail parallels the river for quite a ways and then loops back to rejoin itself. 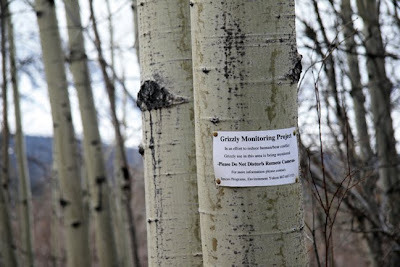 Although technically in town, the trail was sufficiently remote for us to feel the true benefit of the hike. The foliage was still minimal as the temperatures were quite cool still. Nonetheless the landscape had a particular type of beauty that only the spring can possess. Seeing the trees bare and leafless makes you appreciate the transformation that will happen in a few weeks. This sign says "You are in bear country". 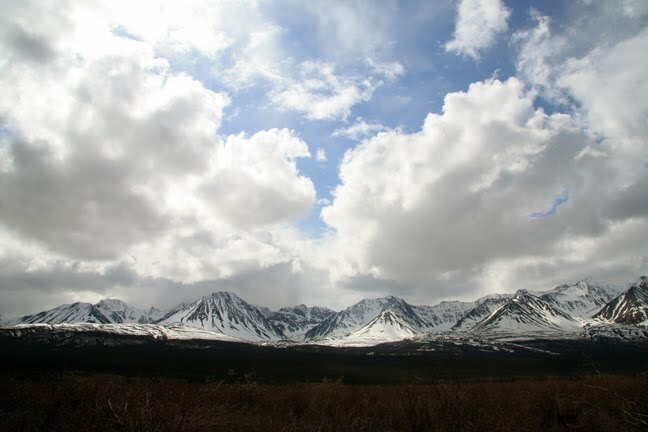 The Yukon is home to an abundance of black bears and grizzlies. I would not want to tangle with either kind. When bears attack people often it is because they have been startled, or feel that the lives of their cubs are in danger. Thus making noise is always wise, and one of the most important things I took into the Wrangells with me last year was a simple whistle. That and talking loudly and making lots of noise will hopefully alert any nearby bears to your presence and thus reduce the chance of a potentially deadly encounter. 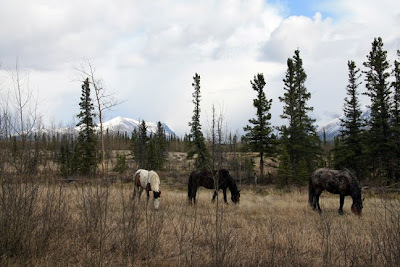 We hiked the loop and decided to make our way back to Whitehorse at a leisurely pace. On the way back we were fortunate to see a bison walking along the highway, along with some horses that had been abandoned by a defunct outfitter. 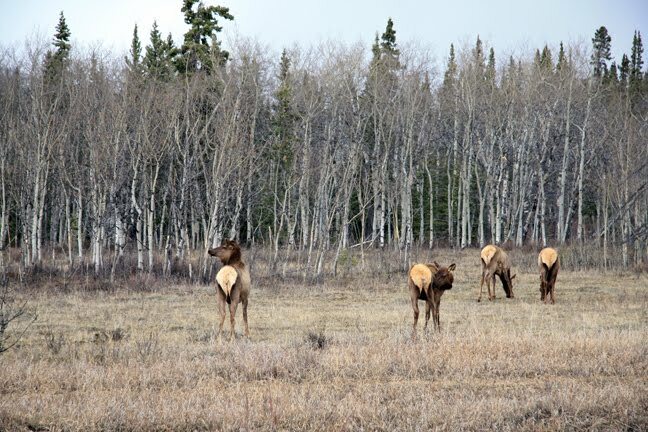 They appeared to be enjoying their freedom and still had thick winter coats on. 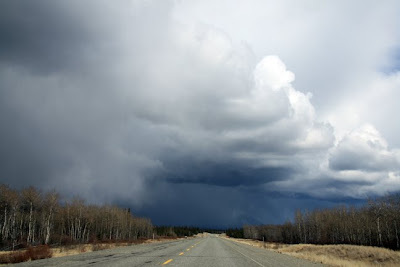 The drive back to town was certainly eventful, as threatening weather brought bouts of rain intermixed with sunshine. We chatted amiably and Allison's dog Nugget had provided us with some entertaining moments throughout the day. To be a small part of such a big place caught me in moment of overwhelming peace and terror, but a good terror. The knowledge that our lives hinge on the smallest variable out here in the vast and unrelenting wilderness gives one cause to pinch oneself and also to sober us in the face of this reality. Wonderful BLOG post. The pictures you took are breathtaking! The open horizon of the Yukon coupled with those immense majestic mountains must have been an almost mystical like experience. 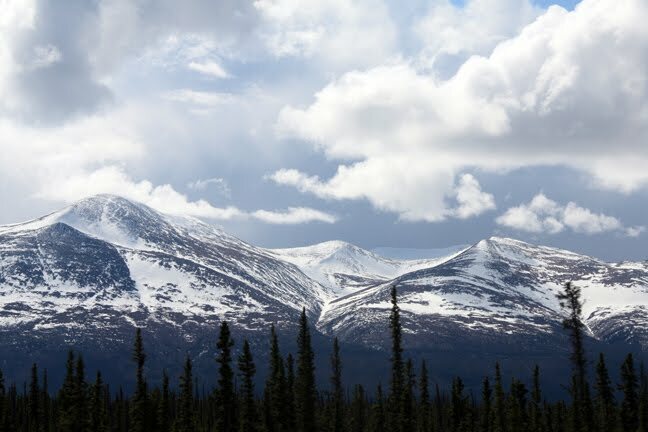 The “tempestuous” clouds as you call them are remarkably beautiful in your photos, sweeping over the landscape as if they are trying to show off even more the spectacular scenery below. I really love your pic of the trail along the Dezadeash river. 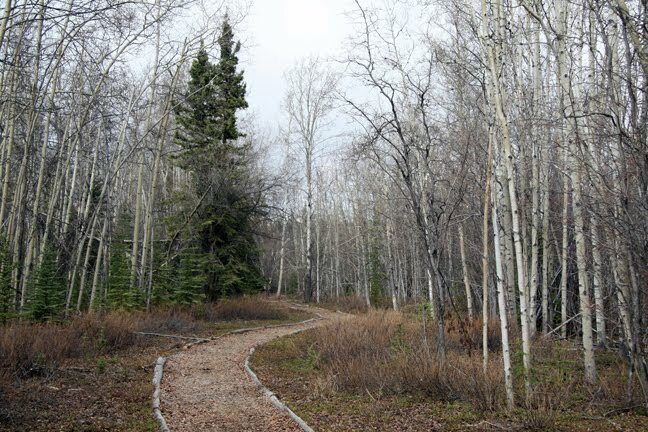 The trail itself, with its careful borders and inset natural contour is so inviting and contemplative. For me, it is this type of peace and beauty in Nature that attracts me like a strong magnet. Even more attractive is when something man-made is combined with Nature to accentuate its beauty without removing or destroying it. Thus I guess I have always loved homes that have plenty of natural light and windows that also try to take in as much of an outside natural setting as possible. I always admired how Frank Lloyd Wright approached and integrated nature with his architecture. Also my college days were spent in the magnificent redwoods of UC Santa Cruz California – primarily in the 1980s before the campus became over and parking lots were built everywhere. It was a unique experience of being able to live in a beautiful/natural contemplative setting where at the same time I was able to study computer languages like Pascal & C++ and Data Structures 101 building code on sophisticated UNIX driven machines yet at the same time walking out of my hi-tech computer rooms into oxygen rich - towering redwoods and beautiful inviting paths to relax and find peace. Thanks for sharing your amazing pictures. 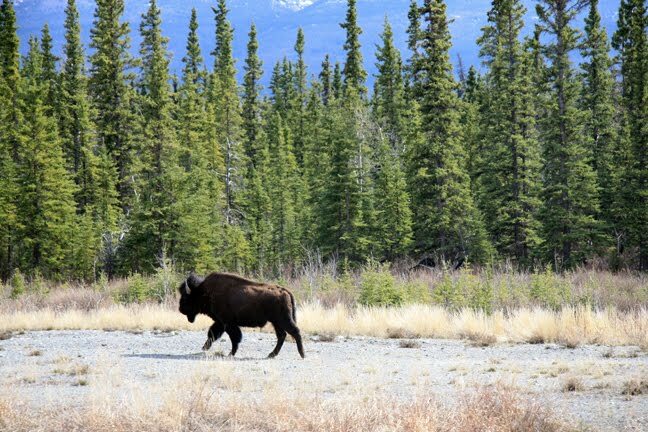 The pics of the animals remind me of my own camping trip in Jacksonhole, WY where a good camping friend and myself actually did run into a bear! And it was scary as hell! What a beautiful way to spend a weekend(?)! I can almost smell the air.